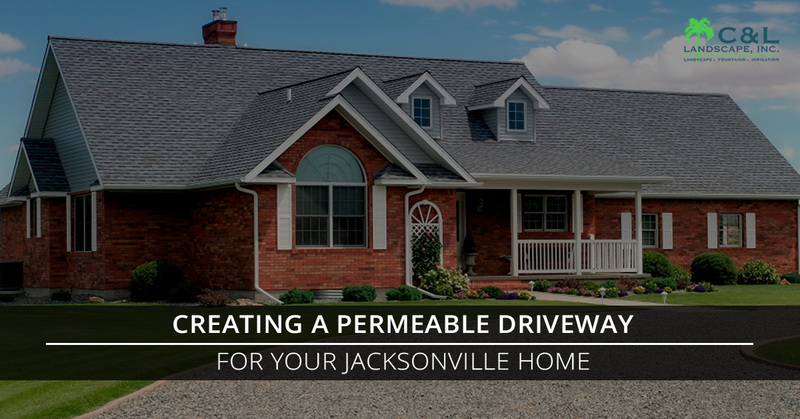 Brick Pavers Jacksonville: How Does Permeable Pavement Work? Do you have a driveway, sidewalk, patio area, or garden walkway that is in need of repair? Maybe your Jacksonville property is missing all of the above, and you’re interested in improving both the function and beauty of your home by adding these hardscaping features. C&L Landscaping is your local expert when it comes to creative projects that involve brick pavers, patio pavers, or other landscaping stones. We’ve worked with both residential and commercial customers to design various hardscaping features that have a positive impact on home values while also making it more enjoyable to enjoy the outdoor areas of the property. These projects range from small and typical to vast and nontraditional. Today we’d like to talk about a new concept of working with brick pavers in a way that’s friendly toward the environment: permeable driveways and pathways. Keep reading to learn more about this revolutionary practice of using landscaping stones and patio pavers in a way that mimics the natural process that occurs on the ground’s surface more closely. If you’re interested in installing a permeable outdoor surface on your own Jacksonville property, contact the experts at C&L Landscaping today. According to the Green Building Alliance, “Permeable pavement (also known as pervious or porous concrete) is a specific type of pavement with a high porosity that allows rainwater to pass through it into the ground below.”Surfaces that are paved with asphalt or landscaping stones in a traditional fashion cannot absorb water, which means that when it rains (as it does so often in Jacksonville) the water must have somewhere to go. This is why elaborate gutter, drainage, and sewer systems are necessary in the city. This leads to vital water being diverted away from the watershed and soil where it’s so desperately needed. How Does Permeable Pavement Work? There are several different ways to achieve a paved-but-permeable surface on your property. Permeable concrete can be used to cover the ground in a way that’s similar to traditional concrete, or brick pavers, strategically placed so that there are spaces between each landscaping stone. In this way, the overall effect is a smooth, paved surface, but when rain falls, it’s able to reach the ground. Contact C&L Landscaping for more info and design assistance with all your brick paver landscaping projects!